In April 2017, our Food & Beverage team hosted an exclusive German wine tasting and paired dinner for top-tier media and members of the trade in NYC. Described by guests as “a once in a lifetime” tasting experience, the highly personalized and dynamic event brought together three of the industry’s leading authorities on German wine – for the first time ever. Honor top members of the U.S. trade community who have acted as advocates for German Riesling at an exclusive celebration attended by members of the trade and media that highlights the significance of the Fellows’ contributions and showcases the range and versatility of German wines – to support the larger Taste the New German wine campaign. Top members of both the trade community and the media are discerning in the events they chose to attend – and look for a truly unique experience that brings together the very best food, wine, and experts while presenting something new and interesting. The Riesling Fellowship is a prestigious award that recognizes the recipient’s dedication to, passion for, and love of German Riesling. Since the honor had never before been bestowed on recipients in the United States, there was an opportunity to provide a truly unique experience. Renowned importers Rudi Wiest and Terry Theise and journalist and long-time merchant, David Schildknecht were appointed 2017 U.S. Riesling Fellows for their passion, dedication and advocacy for German wine in the United States. Each Fellow spoke about their decades of experience advocating for German wines in the U.S. and curated a selection of wines to feature at the event, which underscored their passion for German wine, and provided a uniquely personal experience for attendees. By collaborating with such a prominent group of Fellows to curate the wine tasting experience, Wines of Germany was able to expand their conversation around German wine with notable trade and media attendees. 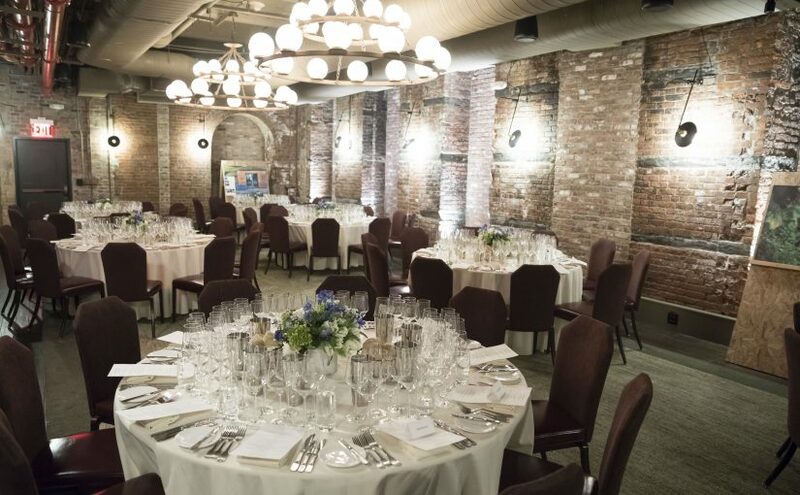 The Beekman Hotel was an ideal setting for this prestigious event, combining the critically acclaimed food of Tom Coliccho’s Fowler & Wells with warm, sophisticated surroundings including exposed brick and modern chandeliers. The celebratory evening began with a walk-around tasting during which attendees sampled a wide range of wines, engaged with Wines of Germany’s Interactive Tasting Experience and admired select images from Frankfurst-based photographer Tim Wulf’s exhibition, Landmarks of Wine Culture. Each of the Riesling Fellows poured three of their favorite German wines at a designated station and also shared a wine at Wines of Germany’s Interactive Table. The Wines of Germany table featured a selection of 12 wines representing a mix of young winemakers, Grosse Gewäch Rieslings, Rieslings with age, and Spätburgunders. With their exploration of German wines well underway, guests were invited into the Awards Ceremony for a glass of Sekt, selected by 2015 Riesling Fellow Paul Grieco. Following welcoming remarks from the German Wine Institute’s Managing Director Monika Reule, Paul led the group in a celebratory toast. During the presentation of each award, honorees took to the podium to discuss their passion for Riesling, and reflect on their decades of experience advocating for German wines in the U.S. The event concluded with a Paired Dinner featuring a carefully curated selection of German wines, expertly paired with a four-course tasting menu prepared by Fowler & Wells. The Wines of Germany team leveraged the excitement around the appointment of the U.S. Riesling Fellows to garner nearly 50,000 media impressions. Event recaps were featured in trade outlets like BeverageMedia.com, WineAndSpiritsMagazine.com, Wine-Wein-Wino-Win.Blogspot.com and LarsCarlberg.com. Attendees took to social media to share photos and excerpts from the event, resulting in posts on Instagram & Twitter that brought the experience to a collective audience of over 20,000 followers.